To put matters into perspective, the PAP still has 92% control of the 87-seat house. Singapore is hardly a multi-party government system yet. PAP’s 92% control is still a stunning success for any political party in a democratic system. Still, the progress made by the opposition after 46 years of near barrenness is remarkable. I had used an analogy in my GE2011’s rally speech. I likened the PAP to an older horse, constantly winning races in the past, but it is now fast tiring. There’s a new and younger horse in town, swiftly improving on its speed. Which horse would you count on to win? It is harder to call now. On nomination day, many would have given the race to the old winning horse in this 4-corner fight. It turned out otherwise, and by a winning margin that not even the most optimistic opposition supporter would have guessed. Two years since I first used this analogy, the younger horse has won 3 races in a row. I guess this is why George Yeo asked, “Whither Singapore.” What’s next? What now? There are other significant points in the Punggol East election as well. Dr Koh is the typical PAP candidate, well-educated and successful as a top surgeon. He’s the technocrat that one can expect to come through PAP’s tea parties, parachuted often at short notice into a contest. Picked for the job but not always willing initially because they are first and foremost, doing well in their career and lacking interest in politics. PM Lee highlighted Dr Koh as an example of the success of Singapore’s system, as he came from a humble family background and succeeded through doing well in school and then in his job. PM Lee also cited WP candidate Lee Li Lian as another example of the success of the Singapore’s system: went through N levels to polytechnic and then university. I suppose that while seemingly praising Li Lian for her ‘success’, the Prime Minister was subtly trying to tell voters to compare and contrast their intellectual capabilities measured by academic achievements. This is nothing new, just done more subtly. In 1984, the PAP publicly announced the stellar O level results of Mr Mah Bow Tan against the seven credits and one pass of Mr Chiam See Tong. That ploy backfired and angered voters. Mr Chiam got into parliament and put up a respectable performance in his 27 years in parliament and became well-loved by the residents of Potong Pasir. His less than impressive O level results did not seem to harm his performance as an MP. I like to think that Li Lian succeeded despite of Singapore’s system. In 2011, I asked a parliament question for the number of Singaporeans studying in private universities in Singapore and overseas. We were told 41,000 Singaporeans were studying for university degrees in private universities in Singapore while the government did not track the number of Singaporeans studying overseas. The number of Singaporeans studying for higher education entirely at their own expenses is about the same as those studying at government funded local autonomous universities. Li Lian is one of the many Singaporeans who did part-time work while studying for a degree, without any help from the government. Dr Koh was a 3-week old PAP member when he was introduced as PAP’s candidate. In contrast, Li Lian joined in 2006 as a passionate volunteer and worked her way up the system, holding many posts in the party. All these while managing a demanding full-time job. Li Lian is one of the many volunteers and members of the Workers’ Party. They are not paid for the tasks they do for the party but are nevertheless willing to slog it out to make sure things work. In contrast, the PAP has full control over the grassroots structure, funded with government monies. They get well-oiled machineries to get things done. In a way, having to work with little just makes one more resourceful. It also helps WP people to connect better with the ground. Resident came to Mr Png with a baby as the pick-up stopped at a car park. He passed the baby over the railings for Png to hold and then Png returned the baby safely to the resident. We have often been told by the PAP leaders that Singapore does not have enough for two teams. I strongly disagree with this damning analysis of the talent of our 3.29 million Singaporeans. I think we are looking for talents in the wrong places. When one is looking amongst the unwilling to serve, we will not find many. I had blogged about this previously (“Political sacrifice – Fishing for the unwilling”) and had spoken about it in my speech on the debate on ministerial salaries. For me, one of the exciting things about the Punggol East By-Election is to see 4 of our new members since 2011 speak at the rallies. We just had our Bricks in Blue concert earlier this month. The tagline is “Building for a new generation”. Building up for the future is more than a brick and mortar building. It is building up the people for a future generation of WP. I am glad Li Lian won the By-Election. She is young and part of the new generation. So are the new people who have joined the party. And Li Lian’s climb to become an MP is proof that we can widen the fishing pond for talent. It shows that with hard work and the right heart, one can make stellar breakthroughs. Many of my friends and family members asked why I joined the Workers’ Party. Some were afraid for me. They asked me, “Is it really safe for you to do this?”. But I told them life is too short and too precious, don’t waste time being kiasu, kiasi and kiagui. Some wondered about my motives. They say, “You are a professor, you got a comfortable life, if you idealistic, go join the PAP, change the system from inside.” I told them change does not come from inside or from outside, but from the correct side. This is the co-driver side where we tell the driver he is heading down the wrong side of the road! Some laughed at me because they know I am not the slapping type. They say, “Hah, you can slap meh, you are a bookworm.” I told them, even bookworms think of their children and would stand up for them. Whither Singapore? It is still early days. I think it will be good that Singaporeans think deeply and determine what type of political parties and politicians that they will accept in today’s political era. And the parties will need time to build themselves up to let Singaporeans judge and decide. Parties will each determine how it will draw in talent and build them up. I believe the days of a mono-coloured constituencies map of Singapore is over. We will have to deal with the realities of other parties sharing the field with the PAP. The different parties will need to figure out how they will play it out on Singapore’s political field. 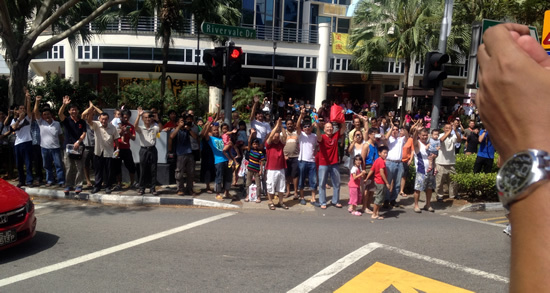 A large crowd came out from Rivervale Mall when our pick-up drove past. Some came up to shake hands as the pick-up slowed down at the junction. 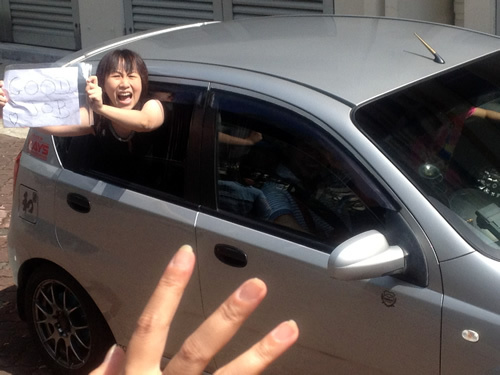 A Pasir Ris resident drove to Punggol East with a “Good Job” sign. 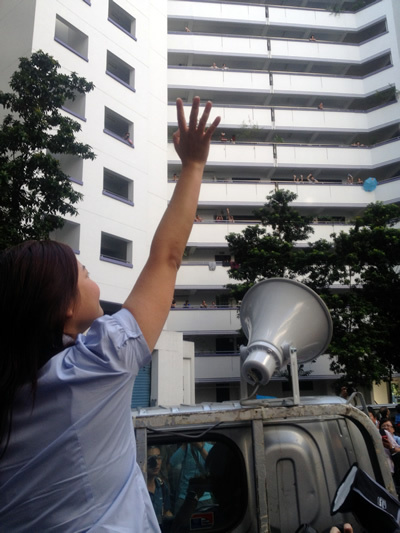 Li Lian waved to her as the resident shouted her support to WP as we drove past. It is now just past 8 pm. Polling for Punggol East By-Election has closed. I wish Li Lian well. While this by-election is relatively mild in terms of the hustling, it has nevertheless generated some negative incidents. Former NMP Calvin Cheng FB messaged me in the afternoon today to let me know that he had just made a police report. Someone had threatened to kill him and burn him over his article published in Yahoo criticising the performance of WP in parliament. Earlier, Reform Party’s candidate Kenneth Jeyaretnam had filed a police report over online threats to his family in London. An arrest had since been made. Reporter Kor Kian Beng had written about the Boo boys of the opposition, referring to the booing that took place during nomination day, mainly by supporters of WP. I was not spared either. 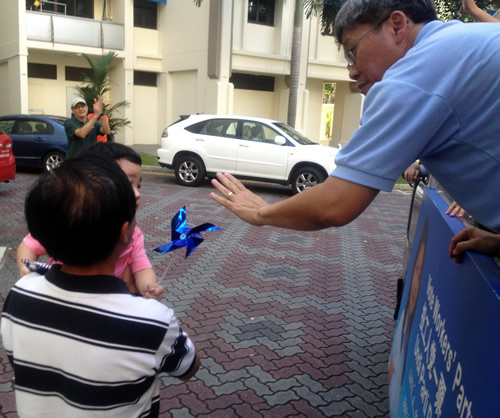 Last Saturday, I was campaigning in the flats next to Rivervale Mall for Li Lian. My car was vandalised. I had just gotten out of my car in the HDB multistory carpark and was walking towards the block where a group of WP volunteers were waiting for me. I received a call from a WP party member. A Zaobao reporter friend of his was in the carpark, his car parked right next to mine. The reporter had seen someone come towards my car shortly after I had left and looked at my parking coupons. The person then walked to the side of the car away from the reporter and took out his phone, seemingly to call HDB to come and summon my car. Out of concern, the reporter who had recognised me, called the WP member to inform me to check if my coupons were valid. I was sure they were but I went back to my car anyway. No one was around my car when I reached. There were sufficient time left on my parking coupons, so I went back to join my group to canvass for votes. It was only when I drove home that I realised the back left door of my car was rather badly scratched. Apparently, the person had taken a sharp object and while pretending to call on one hand, he made a number of scratch marks on my door with the other hand. He would have known I was a WP member. I was in my WP uniform and my car had Li Lian’s calling cards exposed in the back seat. I called the reporter. Unfortunately, he did not take any photograph of the vandal and the vandal was not dressed in any obvious party colours. The candidates of two other political parties, with their entourage of volunteers were campaigning in the same cluster of flats as I was that afternoon. I could not be certain who would have done that to me. I deliberated for a while and decided not to make a police report. Emotions run high during elections. Politics get people high. PAP MP Seng Han Thong was once even set on fire by someone in a community centre. That action simply cannot be tolerated. I do not like to see such behaviours. During nomination, I was in the midst of the crowd. We had made announcements to the crowd not to jeer the other candidates. That was to no avail. Perhaps it did get them to be milder than they would otherwise have been. The jeering came anyway. A few of us tried to “Shhh” the crowd when the booing got too loud. It got quieter for a while but it came back again shortly afterwards. I can understand why they are angry. Many Singaporeans had spoken to me about politics in the 2 years that I had stepped onto this arena. Many felt helpless at their situation. 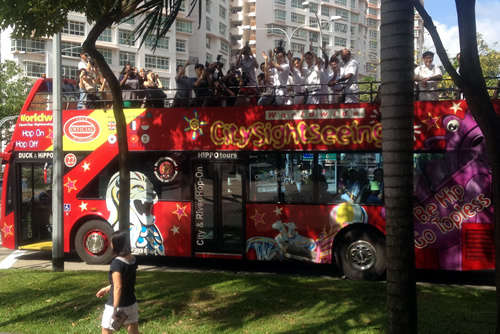 They were angry at the ruling party but could do little to bring the PAP down, or get them to change tracks. Elections offer them the chance to vent their frustrations. The PAP is not helping in the situation. Some of their practices simply turn people off. Long before I harboured any interest to participate in politics, I was already turned off by the way the PAP used upgrading to buy votes. I was turned off by what I considered as overly harsh tactics on people who disagreed with them. I wrote in to the Straits Times forum during GE2006 to criticise the use of upgrading carrots. To me, linking votes to public funds was simply incorrect. Whatever respect I had for their earlier economic achievements was negated by these practices. Now that I have formally entered this arena, finding out that there are contracts such as the software arrangement with AIM strengthened my conviction that such practices are wrong. The Prime Minister had said in his party seminar in November last year that Singapore can’t have a blue constituency and a red constituency. His party has been trying to make sure Singapore’s constituencies are about the same colour, because all constituencies should share the same interest. He was referring to the Democrat versus Republican politics of the USA, where there are often policy gridlocks due to party politics. Being the one party that had overwhelmingly dominated Singapore’s politics since independence, one could also interpret that to mean that the PAP hopes to see Singapore as all white. While we can criticise the Democrats and the Republicans for forcing policy gridlocks due to party’s interests, I also respect that way power is handed over smoothly whenever there’s change of power effected by the results of balloting. The losing party will simply hand over control of the office and come back to fight another day. The president would even appoint members of the opposite camp to become his office bearers. This is a level of maturity which Singapore politics has yet to reach. And I believe the days of a monotone colour for our constituencies map is gone. For the sake of Singaporeans, we need to get to the stage to have a smooth handover of control when constituencies change hand. And that should includes grassroots organisations funded by public monies. Perhaps it is because people are turned off by Singapore’s brand of politics that they vent out their frustrations at election time. However, this is no excuse for some of the behaviours we had seen. All parties should work together to educate people to eradicate such actions. But understanding what lies beneath their frustrations will be useful towards stemming the behaviours. Now, back to my car. My wife told me to leave the ugly scratches alone. Now that I had chosen to walk the path of politics, she said the marks on the car will serve as a reminder to me of what politics can be like. It is the ugly side of politics that we should be reminded of, an ugly side that everyone should work together to eradicate. So if you see a Honda Odyssey on the road with ugly scratches on its left side, you may also wish to ask yourself what you want Singapore’s politics to be like. 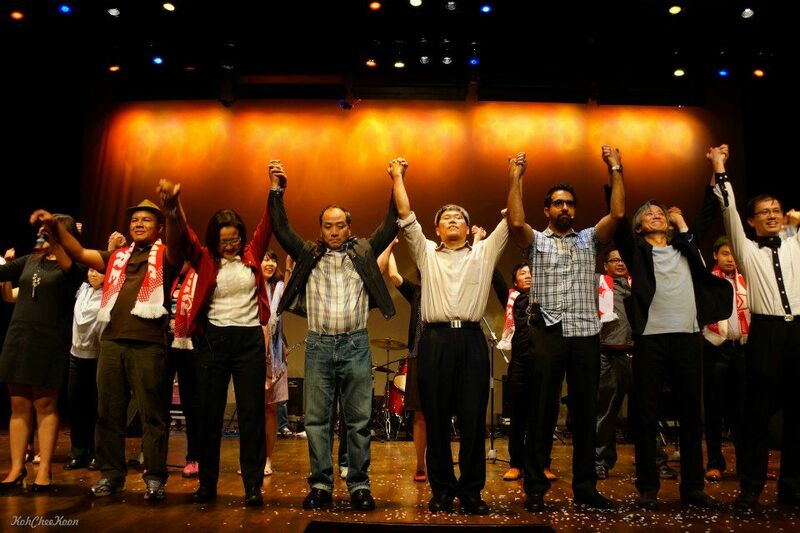 In TODAYOnline report, “Workers’ Party’s third rally as it happened” http://www.todayonline.com/singapore/workers-partys-third-rally-it-happened, I was quoted as saying “If elite students become leaders in society, how will they empathise with the lower-income, other races?”. The text is placed in quotes, which imply that I said those exact words. I had said, “If they move on to become leaders in our country, how do they empathise with the people at the lower rungs of society or with people of other races? “. “Of the 100 students ST polled, 61 had no close friends in the Normal stream. Their schools have only Express or Special streams and they have few opportunities to mix with peers outside school. Just over half of them had no close friends living in three-room or smaller flats. And 45 had no close friends of a different race. Here, there was a stark difference between the Special Assistance Plan (SAP) schools, which have few non-Chinese students, and the non-SAP ones. Some 82 per cent of the Nanyang and Hwa Chong students had no close friends of other races, compared to 12 per cent for the other three schools. TODAYOnline’s quote may give readers the impression that I object to ‘elite students’ becoming leaders in Singapore. I was expressing concern that students in top schools who do not have close friends of lower income or of difference academic abilities or of different races will find it hard to empathise with others. Another ST report on 17 Nov 2012, “PSLE the cause of lacking student diversity” http://www.asiaone.com/print/News/Latest%2BNews/Singapore/Story/A1Story20121117-384073.html, had also referred to these same data. 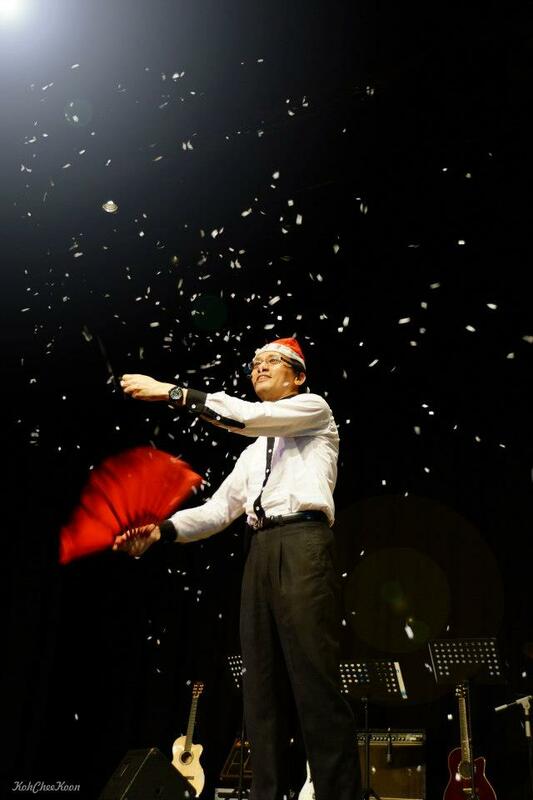 In it, it cited DPM Tharman as being concerned too with the lack of diversity of students in schools. The article pointed to PSLE and the secondary school admission system as the root cause of this lack of diversity in schools. I would like to see an education system where there can be more diversity of students. I feel the school admission system based almost entirely on PSLE T-Score should be critically re-examined. The system can be adjusted to allow students of a greater variety of academic background and social status to mix together. Unfortunately, the system has progressively moved towards separating schools by the academic abilities of students they enrol, which has led to this lack of diversity of students. For the record, I will say that there is nothing wrong with students of top schools becoming leaders of the country. In all likelihood, many of them will become our future leaders. Hence, it is more important that we expose them to the realities of society in their formative years. Dear voters of Punggol East, dear Singaporeans. Thank you for coming tonight. Yesterday, Dr Koh of the PAP said he initially rejected the Prime Minister when he was asked to be their candidate for Punggol East. Dr Koh said, and I quote “I don’t want to do populist politics. I want to do real work.” Unquote. Dr Koh, if you want to do real work, join the Workers’ Party! Lee Li Lian joined WP in 2006 as a volunteer. Through hard work, she worked her way up into the Central Executive Committee and held various posts such as Assistant Treasurer, Youth Wing president and Deputy Webmaster. She worked as legislative assistant in the Eunos Division of Aljunied. She was not parachuted into Punggol East. She campaigned here in 2011. She is doing a lot of real work, Dr Koh! Yesterday, our chairman, Ms Sylvia Lim shared about what happened when we took over the Aljunied Town Council. There are some contracts that seem to be designed to trip up any opposition party that dares to take over a PAP territory. When the PAP candidate wins, he will have the grassroots organisation paid for by the government to work for him. He will have unrestricted access to community facilities. He can continue with all the contracts of third parties with the Town Council, including for the Town Council Software Management System. No one will threaten to terminate his contract, just because he has won. Dr Koh will be on a travolator, assisted in his journey by the system. But not for WP. We will be on an inclined threadmill. We have to work a lot harder to do real work. But we will do it because the type of politics that the PAP has put in place in our beloved country cannot be allowed. The Workers’ Party is willing to do real work for you. Lee Li Lian is willing to work for you. Today, I want to talk about education. Many of you have school-going children. It is an important subject because it affects our future. Children are the future of our country. We have made many proposals on education in The Workers’ Party manifesto. The WP MPs and I have also raised many issues relating to education in parliament. Education has been a way to enable people to climb up the social ladder, and many have done so in the past. Today, a bright and hardworking person can still move up socially by doing well in school and progress onto a good career. However, over the years schools had been ranked and branded to create schools of different class status. Systems are created to sort students through various pressurising high stake examinations. This has created an elitist system that has made it harder for those with lower income to climb up. It also resulted in a culture where parents resort to extensive tuition for their children. Five years ago, Sunday Times reported that 97 out of 100 children surveyed had tuition. Today, the situation is just as bad. We even have people trying hard to get their children into the Gifted Education Programme, or GEP through tuition. You may recall the scandal last year when a tutor faked his credentials and fooled many parents into paying a lot to him to train their children for the GEP. Mr Lee Kuan Yew observed two years ago that more than half the students at top schools had fathers who were university graduates. On the other hand, he noted from data he had that less than 13.1 per cent of students in neighbourhood schools had university graduate fathers. Mr Lee also said that admission into primary school is not meritocratic, as it is based on the social class of the parents. Two months ago, we were told that 60% of students in 6 top primary schools live in private houses. While MOE may want all schools to be good schools, their policies divide people into social classes. From the Primary 1 enrolment policy to the way schools are structured, MOE has created various categories of schools and sort students very finely into each of these types of schools. The latest is secondary schools just for normal technical students. I fear this will lead to a greater divide of social classes. A survey by the Straits Times last year found that the majority of students in top schools do not have close friends who live in small HDB flats, nor friends in the Normal Stream, nor friends of other races. If they move on to become leaders in our country, how do they empathise with the people at the lower rungs of society or with people of other races? •	and more support in local universities for Singaporeans. I also made an alternative proposal for pilot schools that provide through-train from primary through secondary. These schools can develop children holistically without the distraction of a high stake PSLE sorting examination at the tender age of 12. I believe this is workable as other countries with such system have done well in international benchmark as well. It will put more emphasis back to nurturing students rather than to prepare them from one sorting examination to another. I have also probed into how much our government spends on foreign scholarship. This is not because I am anti-foreign scholars, but because I feel we are spending too much with questionable returns. Through a series of parliament questions, I figured the government gives out more than 2,000 new scholarships to international students each year. As each scholarship is valid for 4 years, there would be over 8,000 international scholars in Singapore. I worked out that it cost our government at least $144 million each year. This figure excludes the scholarships given by Government Linked Companies, which MOE is unable to provide data for, and other allowances which may not be included in the answers. We were also told that a third of the scholars did not achieve at least a 2nd upper honours, the usual standard expected of scholars. When asked in parliament, the Minister said that MOE has strict criteria for scholarship renewal, which include achieving consistent academic performance throughout. Yet from the results achieved by the scholars, MOE does not appear to be strict in enforcing this. The Workers’ Party has spoken out on this. Dear Voters of Punggol East, the Workers’ Party will use parliament processes to scrutinize the government to make them accountable to the people. We will also contribute in other ways as long it it is pro-Singapore. Some of the WP MPs have been invited to contribute ideas for policy input or to sit on committees. Last year, I accepted an invitation to be on the ACE committee which looks after entrepreneurship development in Singapore. Every month, we look at proposals from aspiring new entrepreneurs to determine the type of support we can give. On my own, I share freely in talks on this topic in education institutions and with new entrepreneurs. I believe this can be my little contribution towards developing the business startup scene in Singapore. At the same time, I have also spoken out against policies that have caused industrial rents to become so high and against government linked companies and large cooperatives crowding out SMEs. These are hurting the development of entrepreneurs. I know Li Lian and her views. I have confidence she will play the role of a constructive, responsible and rational opposition when you elect her as your MP. Finally, I like to address two groups of people today. The first is the 41% who voted for Li Lian in 2011. Thank you for placing your faith in her. Li Lian has returned, with 2 years of solid experience in Aljunied behind her. She is now more experienced to serve you better. Continue to place your faith in her. The second are those who did not vote for Li Lian. Perhaps you were uncertain if The Workers’ Party could manage your town council. You can see that we have handled Aljunied and Hougang well. Or perhaps you were afraid that the government may be suddenly changed. This is a By-Election. The PAP is already the government. You now have the chance to tell the PAP that you are still unhappy. You want a Singapore that’s fairer and kinder to you. Stay firm in your resolve to vote for change. Stay firm in your resolve to tell the PAP that their brand of politics must be taken down. Vote for change. Vote the Workers’ Party. Vote for Lee Li Lian! Good evening dear voters of Punggol East. Good evening dear supporters of the Workers’ Party. Rain or shine, muddy or dry pitch, you are always here to support us. Thank you. On Sunday, Education Minister Heng Swee Kiat told you to vote for PAP so that The Workers’ Party will work harder. The Education Minister has got it all wrong! Which party is in government and has created the policies that are hurting you? 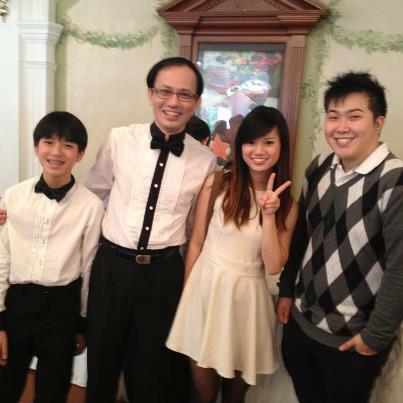 The PAP! The PAP needs to work harder to improve their policies and to improve your lives. Mr Heng has forgotten that whether they win or lose, the PAP’s candidate will still be the grassroots advisor. He has forgotten that the losing PAP candidate will still get access to community facilities to continue his party’s work. THESE will not be given to the WP if we lose. Mr Heng has also forgotten that the elections department reports to the Prime Minister, who is the secretary-general of his party. The PAP can do wonderful magic. They can tear up a constituency and move it around. They can make constituencies disappear just before a general election. Only when you vote an opposition in can you vote one and get one free, because PAP will start to treasure you and work doubly hard for you. Only when you vote an opposition in can you ensure that Punggol East will stay as its own constituency. Dr Koh, the candidate of the PAP has said he wanted to have more child care facilities here. He’s right that there should be more child care centres here. Dr Koh will however have to content with a PAP’s policy that is flawed. Child care services have certainly become important. Over the past 8 years, with more working parents, the number of children enrolled in child & infant care centres has doubled to 76,000. Child care fees have also gone up. Over the same 8 years, average fee has shot up by some 50%. Many centres, especially those in new towns like Punggol East are full. You sometimes have to wait more than a year to get your child into a centre that is more reasonably affordable. This is an issue that affects many Singaporeans. Last week, the Prime Minister said the opposition has not presented any alternatives in parliament. Well, I remember presenting an alternative childcare policy in September as an adjournment motion. I also remember that the government has yet to answer many of the issues I had raised on this matter. Let me elaborate. In 2009, the government came up with the Anchor childcare Operator scheme. Conditions were set such that many long established and reputable operators in the childcare industry could not qualify. Only the PAP Community Foundation (or PCF) and NTUC’s My First Skool became anchor operators. The government said that grants given to anchor operators will be $30 million every year. Anchor operators have opened over 132 new void deck sites in the 3 years since the scheme started. In this same period, only a few HDB sites were available for bidding by private and other non-profit operators. From parliament answers, I calculated that Anchor Operators received grants averaging $600,000 per new centre. Their centres in HDB void decks pay rents 10-20 times lower than what is paid by private operators in similar void decks, based on results from recent tenders. Because there are so few HDB sites now available for non-anchor operators, rents have been bidded sky high, causing fees to rise rapidly. In fact, the void deck childcare with the highest rent in Singapore is here in Punggol. The stated purpose for Anchor operators is to provide affordable, accessible, and high quality childcare. But all these are not happening with PAP’s policy. The fees charged by our two Anchor Operators are in some instances higher than that charged by some private and non-profit centres that do not get such generous grants or have to pay more in rent. In other words, the two anchor operators are protected from competition. They do not need to work as hard as they should to make fees as low as they can. In the Lien foundation survey last year, there are more parents happier with the services of any other category of centres compared to that of PCF and NTUC. So despite huge grants available only to PCF and NTUC, satisfaction of their customers is lower than others. In 2010, the government started SPARK accreditation to raise the quality of preschools. Their aim is to have 85% of all centres to be SPARK-tested by 2013, which is this year. Guess what? Only 12% of the centres operated by anchors met the SPARK criteria as of last year when I questioned the minister in parliament. The anchors are so far off the government’s target, yet they continue to receive huge grants. After studying these data, I presented an alternative proposal in parliament. It is to make childcare as a public good, with active competition by all. These include the government making all sites operating on government spaces to be at low managed rents, and for the government to be able to directly regulate fees of centres that benefit from grants and subsidized rents. This can be done because the majority of all childcare centres operate on government owned sites. Right now, the government is toothless to control fees. It gives out a lot of money but cannot stop fees from rising. It can only advise operators to give three months’ notice before increasing fees. Rather than rely on just two operators, the government should open up for competition to all operators based on a more reasonable set of anchor qualifying criteria, and to push these operators to do more to improve quality and to tightly regulate their fees. With this alternative model, competition will keep all operators on their toes. They will need to be innovative and affordable. This will benefit all of you. So the solution is not for Dr Koh to ask for a new centre here and a new centre there. Think… If it was so easy, why is it a nationwide problem? Why couldn’t your previous MP do that for you? This is because the PAP’s childcare policy is in need of fixing, just as there are many PAP’s policies that need fixing. The Workers’ Party has spoken out in Parliament on this. And the Workers’ Party will continue to push the government when we find policies that need fixing. Vote Lee Li Lian into parliament. She will be a good and hardworking MP for you. She will be your voice in parliament. Come 26 Jan, vote The Workers Party. Vote for Lee Li Lian. At the recently concluded WP Bricks In Blue variety show, I had thanked the audience for their wonderful support. I shared that I had personally experienced the magic of the support of everyone during my two years in politics. It is the magic of their support that has carried the Party so far, and it is this magic that makes dreams come alive. Whether the help is small or big, when many come together to help, we can make dreams come true. With that, I turned a piece of wet tissue paper into a snow storm lasting nearly a minute. I meant every word of what was said. For this show, I was brought on a magical journey. It was magical not because I had put up a magic performance, but for what I had experienced in the process. When the idea to put up a variety show to thank our supporters became serious, each MP had to put up an item individually. Singing was never my forte. I needed an alternative, and soon. Being fascinated with magic from young, I toyed with the idea of performing magic. A WP member, Michael heard about it and offered to teach some tricks to me. So I picked up a few tricks and acquired some small props. Still, I was not confident how the tricks would work on the big stage, and how to script the sequence of acts. For lack of a better alternative, I committed myself to doing magic for Bricks In Blue, despite having never performed for anyone before. A month before Bricks In Blue, the publicity went online. That same evening, I received a Facebook message from Eugene, a young man living in Aljunied GRC. He is a full-time student living overseas and is back on holiday. He had worked full-time for a professional magic team and had performed on the big stage. He had some professional props which he could loan me as well. It was God-sent. So I loaned his props, including a crate with which I was to be handcuffed and locked in. I would have just a few seconds to unlock myself, escape, and change position with my assistant. He warned it would take a month of practice to get the act perfect. The assistant would be my eldest daughter, Faith. The practice required both of us to be fast and coordinated. Eugene also helped to sequence the routines, polished our script and introduced a few more tricks. Then, we tested some of the effects in five of the Christmas parties held in Aljunied GRC and in Hougang. When Faith could not attend two of the sessions, I recruited my son, Harel to stand in. He loved it so much that we decided to add him into the big show. He would turn a burning torch into a rose. For Bricks In Blue, we had three full-dress rehearsals and two other combined practices for the singing items in a studio. It was at these sessions that I saw how the many volunteers from all the divisions in Aljunied and Hougang put in so much sacrifice to make the show a good one. In the 56 years of WP history, the Party had never put up a variety show before. Everyone was determined to put up a good show. Many of the volunteers have a demanding day job. By day, they are lawyers, accountants, businessmen, office executives, hardworking workers and many more. Many have their families to take care of. Some are students and some even had school tests in between the rehearsals. Yet they would practice hard to make things as perfect as they could. None of us are professional entertainers. Most do not have performing experience. The back stage crew worked tirelessly too, ensuring that the setup, sound system, backdrop and lighting worked according to plan. There seemed so much to do in the short two weeks that preparation for the show went intense. As I watched how these volunteers piled in the hours after work and after school, I wondered what drove them. I also thought about all the hours they piled in at the weekly Meet-The-People sessions and in organising all the constituency events. I recalled the energies they burned during GE2011 and during Hougang BE. I remembered how empty fields and stadiums were transformed into huge rally sites. The logistics were immense. Setting up within hours and dismantling immediately thereafter, repeating that night after night. Combing houses tirelessly to meet as many residents as possible. All these were executed by the determination of hundreds of volunteers, many of whom have day jobs. These volunteers are the engine behind what keeps the Workers’ Party going when the going gets tough on the ground. They are the volunteers who do not get to go to National Day receptions at the Istana which are for official grassroots members recognized by the government. They will never get any awards by the government. No PBM, no BBM. They will not get any priority for registering their children into their preferred primary school. They will not get parking privileges. Yet they work on tirelessly. I too had experienced how many would come up to offer help to us. I experienced that during GE2011 as a newbie in the political scene. People I had never met before would magically coming forward to help in all sorts of things just when I needed help. Even for this show, I took up the challenge without any idea how I would learn my magic or how to handle the performance. Yet, everything happened magically, with people who came along the way. This is the real magic which I had experienced. It is the magic that had carried the Party through difficult times and will continue to carry the Party forward. The magic is in all of you. Thank you, wonderful volunteers. Thank you, wonderful supporters.